Forget tin cans and strings. These days, kids can call each other with their voice-activated wristphones. The gadget is called the Tinitell. The Swedish team behind it calls it the “world's smallest wearable phone designed for kids” and has raised $104,829 for it on Kickstarter — beating its $100,000 goal with 21 days to go. Kids can make a phone call by simply pressing down the big button in the middle and calling out a name, like "Dad.” Tinitell can also accept phone calls and forward calls to smartphones outfitted with a special app. To mitigate the creepy factor, Tinitell lets parents set who is allowed to call the phone. Plus it has GPS for tracking your kid, a much more convenient and less humiliating alternative to the child leash. Right now it's only available through pre-order via a pledge on Kickstarter. With a suggested retail price of $179, parents will be glad to know it is supposedly water-proof and sandbox-proof. 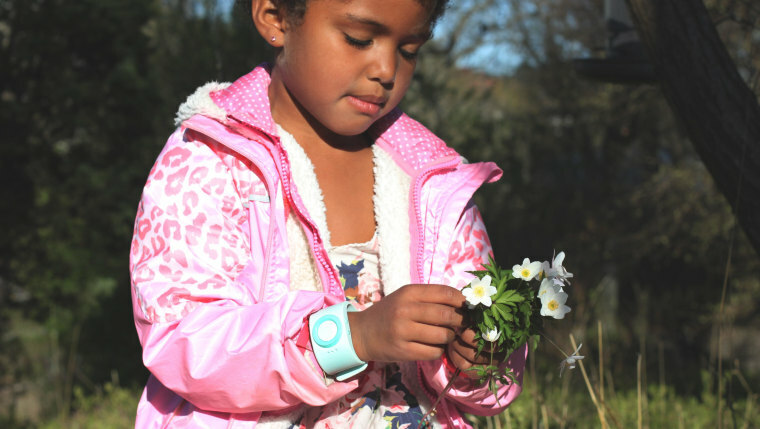 Tinitell is not the first wearable smartphone for kids. FiLIP also lets parents talk to and track their kids, using a touchscreen instead of voice recognition. (It can also accept text messages). Sadly, the retail price won't include voice plans. Tinitell recommends pre-paid plans, just in case Timmy is tempted to spend hours on the phone talking about Spider-Man. While it's mainly being marketed to kids, the company noted that Tinitell could "appeal to grown-ups seeking a basic wristphone for rugged outdoor activities." Remember to add that to your list, lumberjacks: leather boots, ax and a child-sized, aqua-colored wristband.